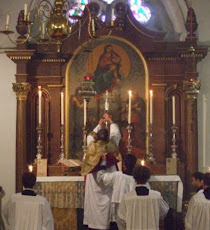 Fr Hunwicke's Mutual Enrichment: Heureka! Heureka! He said: "Wait a minute. I want to bathe in it." And took off his whatyoumacalls! I am not sure what the sartorial variations of certain of the hierarchy are meant to represent, Archbishop Martin of Dublin being an example for some time. For him, it may be an ‘ecumenical’ thing – solidarity with the C of I clerics who invariably wear gray in a multiplicity of shades. Perhaps it is a Vat II thing - like the black of funeral Masses being replaced by white – indicative of our now being a Paschal people hell-bent on heaven. Father: I wonder whether you could give us a reference to where you found that quote from Ronald Knox. It should be sent to Father Spadaro who thinks that 2 + 2 can equal 5 in theology! To Et Expecto above - I live in Niagara Falls and the gloomy old dean of St Paul's seems to be followed by rafts (pardon the pun) of clerics over said Falls. Oddly enough if one stands right by the edge and stares into the huge, flowing plunge you can feel the pull. It must be like that on the edge of heterodoxy - there is a demonic pull towards the abyss. Regarding the pull towards dressing like laymen, with colours like blue and grey and white, I wonder if I prefer that to a collar and tie. Mention of Dean Inge reminds me of a quote in a grammar of Greek (in a chapter re "Some Irregular Verbs") that is attributed to him--that ALL Greek verbs are irregular to the verge of impropriety. But, speaking of "continuing (continuous?) revelation," that, of course, is a position that Ratzinger was accused of holding as far back as his seminary days and right through his Dei Verbum days up to the present. A point of "inner continuity" with Bergoglio? Here's a link to a site that links to Fr Hunwicke--which doesn't mean that either recommend the other, of course: The Debate on Tradition. In this blog the author includes a quote from Ecclesia Dei in which Lefebvre is attacked for having "an incomplete and contradictory notion of Tradition." IMHO, however, a good case could be made that the position espoused in Ecclesia Dei re "the living character of Tradition, which, as the Second Vatican Council clearly taught, 'comes from the apostles and progresses in the Church with the help of the Holy Spirit'" does in fact constitute a form of "continuing revelation." The passage from Ecclesia Dei continues in a way that is for me most alarming, smacking as it does of an uncritically optimistic as well as a very subjective notion of Tradition and, therefore, of Revelation. A friend who is a priest in the diocese next door to Dublin was wearing his customary black cassock and Roman collar when visiting a parishioner in hospital. A nurse assured him he must be mistaken "she's not one of yours, reverend". Apparently, she assumed any cleric who is properly dressed must be Church of Ireland, after all our lot almost never look the part! Almost immediately on the election of PF there was a widespread, sycophantic move on the part of a certain type of prelate to adopt a Bergoglio-style pectoral cross. Dean Inge was said to have been dozing through a S. Paul's Chapter meeting which was engaged in an interminable discussion as to whether or not the City should be asked to install a pedestrian crossing for the use of those traversing the road to reach the Cathedral. He woke up and interjected, "Could you not just post up a sign reading 'Nisi Monumentum Requieris, Circumspice'". Nicholas Bellord: the Knox quotation is from 'Absolute and Abitofhell' (1913), his brilliant Drydenesque satire on the group of Oxonians who produced 'Foundations'. You can find it online. Apparently now it has emerged that the Viganò letter-gate affair is not just a half-truth, but an outright deception. It is reported over at Sandro Magister and Catholic World Report that B 16’s letter included another paragraph that was neither read nor published, which was Benedict’s objection to 2 of the authors of Francis’ 11 books, one of these being Peter Hunermann, a man who had written and worked to undermine Pope John Paul II and Pope Benedict. That is the last straw. Pope Francis has hired men to lie and subvert the truth. I now pray for a swift end to his underhanded pontificate. Speaking on the 'Modern Churchmen's Union', how in the name of all that's holy, did Cuddesdon College end up merging with Ripon Hall? When I was a young Anglican in the US, Cuddesdon was considered the Nashotah House of England!